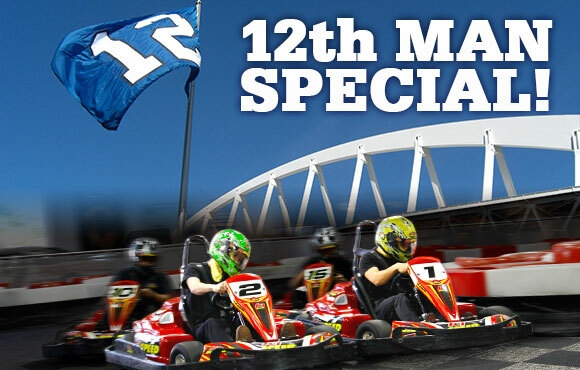 K1 Speed Seattle’s 12th Man Special! Your Seattle Seahawks are in the BIG GAME! Show your team spirit and wear your jersey to K1 Speed Seattle on Sunday, February 2nd and receive 2 races for $25 with this coupon! *Print out, or present this image from your smart phone to receive this deal. Offer good at K1 Speed Seattle only, Sunday,February 2nd, 2014. Not good for Group or Corporate events. One deal per person. Not transferable. Must be a member in order to race. Two races must be purchased at the same time. Cannot be combined with other discounts or coupons. Expires 2/2/14. Code 10211.